Cambridgeshire and Peterborough NHS Foundation Trust has launched a new magazine to promote mental and physical health awareness, which will be of interest to all employers looking to gain a greater insight into the impact of mental ill health on employees. Speak Your Mind is edited by Kelly Mansfield, who for many years was the editor of Workplace Law Magazine, which we published. Kelly was (and is!) a brilliant editor, and it was during her tenure in charge that our company achieved arguably its greatest accolade, in winning the Periodical Publisher’s Association Award for Best Online Subscription Website in 2008. Around that time however, Kelly became ill. I won’t go into the details here – that’s for her to do, if she ever wants to share it. But I do know that she felt her ability to do her job, and many other things in her life, slipping away from her, to the point that she ultimately became sectioned under the Mental Health Act 1983. It was a scary time for her, and the start of what would be nearly ten years either accommodated by, or in the care of, social services. Kelly is a fighter, and with the support of her very friends and family, it’s really wonderful to see that she is regaining her confidence and is back doing what she does best. As part of Kelly’s rehabilitation with the Recovery College East, she came up with the idea of launching a new magazine, with the support of the Cambridgeshire and Peterborough NHS Foundation Trust. 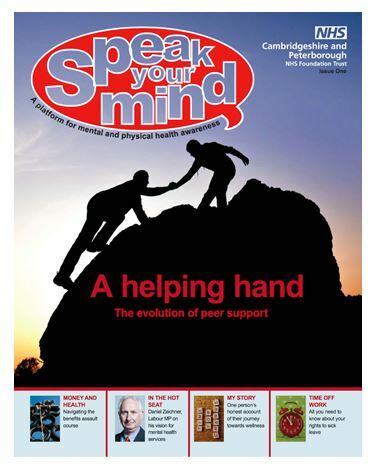 And after spending months overcoming barriers relating to budgets, technical issues and editorial contributions, Speak Your Mind has now been launched. The first issue of the free magazine can be downloaded from the NHS website (pdf). What gives the magazine a unique focus is that it is written for people who are experiencing, or who have experienced, mental ill health – written and edited by people who’ve been through the same or similar experiences. It’s well worth a read. Kelly is particularly keen to include contributions in future issues from both large and smaller organisations, to share stories of how they are managing mental health at work. She’d also be interested to talk to any employers who wanted to collaborate or to incorporate the magazine as part of a corporate well-being programme. You can contact Kelly by email at symmagazine@cpft.nhs.uk.